Dhaka, once upon a time a haven for leading a better life in Bangladesh, has become one of the most unlivable cities in the country. 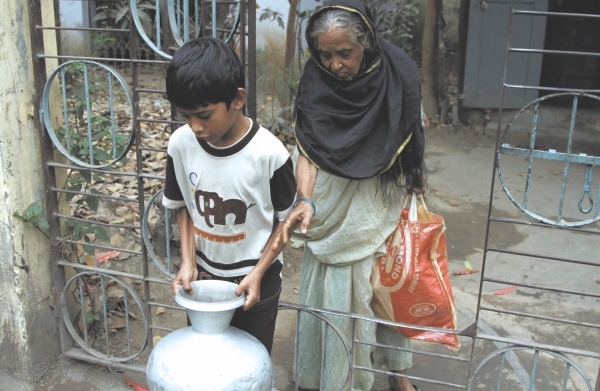 With people enduring the pain of living life without the proper supply of basic amenities, such as water, gas and electricity, the life of a Dhaka-dweller seems to be filled with misery. Struggling with their daily activities, people find their dreams of living a modestly decent life in the capital slowly fading away. 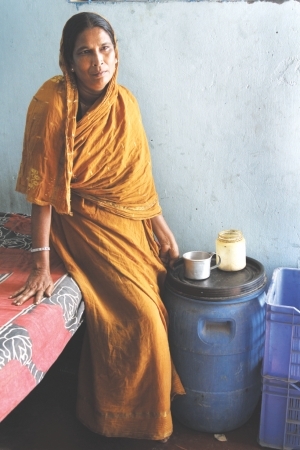 For Ayesha Islam, a housewife residing in New Paltan, Azimpur, the lack of access to clean water and gas has forced her to change her daily routine, just so that she can cook at least two meals a day. "I have to wake up at 6 am everyday to make breakfast since the gas-pressure is very low between 8 am and 3 pm. The limited amount of gas doesn't allow me to cook for my children. Food that normally takes 30 minutes to prepare usually takes around 3 hours. I have to start cooking from 10 am so that my family can have lunch by 1 pm," says Ayesha. Improper water supply forces dwellers to collect water from pumps located far away from their homes. Adding to Ayesha's woes is the polluted water which her flat receives through the pipelines. The water, according to her, isn't suitable for either drinking or bathing. "Smell it yourself, you can't possibly take a bath with this water and it isn't safe for drinking even if you boil it," she exclaims. Echoing Ayesha's sentiments, Jahanara Begum, who lives in a different building, in the same area, claims that the water contains insects and dirt. "We can't take a bath with the kind of water the WASA supplies, it gives me rashes. Earlier I used to go to my sister's apartment to take a bath, but lately, her landlord refuses to let me enter. I bathe once in two or three days because of the stinking water,” she says. As if putting up with contaminated water everyday isn't enough, the mother of two also struggles to cook due to the lack of gas supply. A heart patient, Jahanara rarely manages to comply with recommendations from doctors due to such bizarre conditions. "Doctors have asked me not to eat anything cold as it would have a bad effect on me. However, with no gas available for most parts of the day, I can't help it. It's not possible to heat something with no gas. My children often complain and tell me that they want to eat something warm, but I can't do anything about it," she says. To fight the water-related problems, several families living in the New Paltan area have attached water-filters in their homes. However, the solution, as it turns out, doesn't suffice. "The water is so dirty that people need to change their filters once in every ten days. We even find red ants, which come along with the water, stuck in the filters," says Saiful Alam, caretaker of one of the buildings in Azimpur. As a result of the water-related problems, dwellers in the New Paltan area are forced to go to a water pump, located four kilometres away, in order to collect drinking water. Residents claim that while the water pump provides clean water, they often have to wait in line for hours before they can get their buckets filled. "Sometimes there is no electricity available at the pump which makes the wait even longer," says Amdito Baron, a BBA student from AIUB. "Seven of us live in a flat in New Paltan and we take turns to come here and take water. I have an exam tomorrow and yet I'm still here because it's my turn today. I am losing out on valuable time just because we don't get clean water at home," he adds. Apart from Amdito and the various others, who were collecting water for themselves, one could also notice rickshaw-pullers stacking their vehicles with gallons of water and getting ready to deliver them to various households. Upon contacting the Lalbagh-based Executive Engineer of the Water and Sewerage Authority (WASA), the official responsible for the water-flow in this region, he says," If the water isn't clean, you (residents) should contact me. If you don't, then what can I do?" However, people claim that no matter how many complaints get registered, the result is always the same. Speaking to the Star, Mehdi Jamil, a member of the New Paltan Community Club says, "We have repeatedly informed our MP regarding the water problem. His only reply was that while the water may smell dirty and may even look dirty, it’s actually 100 percent pure. We don't know what to say after that. Since I can afford it, I can get water from outside. But for the ones who can't, it's a living hell." 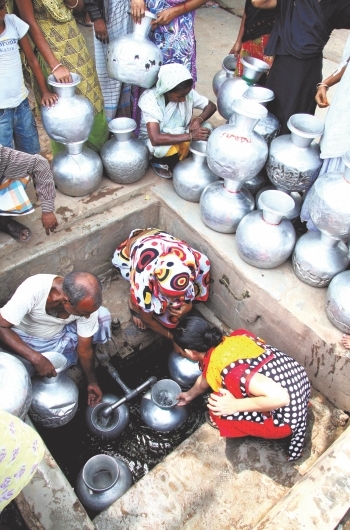 Dr Mustafa Jalal Mohiuddin, MP of the constituency, however, claims that the water-crisis in the region is one of his top-most agendas and that various steps have been taken for refining the water. "I understand that it must be extremely difficult for the residents, especially for the elder folks, but I am trying my best to solve this problem. The water in this region comes from Buriganga and Saidabad and therefore needs a lot of refining," he adds. Jahanara Begum, a heart patient residing in New Paltan, struggles to follow her doctor's instructions due to improper gas and water supply. With regard to the gas crisis, Mohiuddin blames it on the increasing number of buildings. "There has been a huge growth in the number of people staying in the Azimpur area and that is the main reason behind the shortage of gas." He, however, says that they are planning to expand the size of the pipelines in order to provide more gas to the flats. A move, the residents of the region claim, will take a long time to be implemented. As concerned officials provide excuses and prolong the unwarranted situation by playing blame games, the residents continue to lead a subhuman life. As Jahanara Begum puts it, "Had I known that life in the city would have been so difficult, I would have never left my village. Although we had problems back there as well, we however at least managed to eat hot meals and drink clean water." People in New Paltan are not alone in this struggle. Several areas in the city have been suffering from electricity, gas and water problems. A recent protest against WASA by the Paribesh Bachao Andolan and Bangladesh Centre for Human Rights and Development with regard to the increasing water crisis reflects the various water-related problems faced by the city dwellers. Speakers at the protest criticised the WASA and stated that the irregular water supply had encouraged some people to deal in water, a step that has ultimately increased the cost of water. 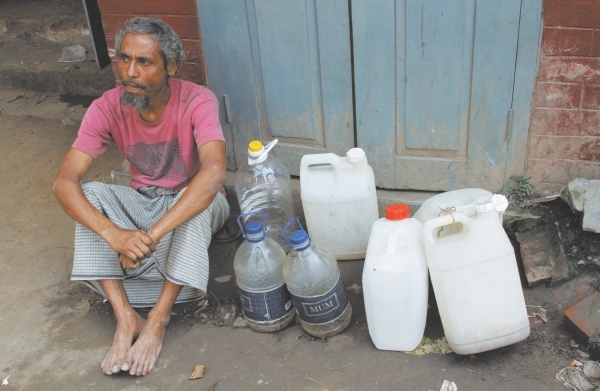 Various other parts of the city are also suffering due to an acute shortage in gas supply. Reports suggest that more than 20 areas in the city have been hit by gas crisis over the last one year. Some of the areas include, Uttara, Bashabo, Indira Road, Moghbazar, Ibrahimpur, Bibir Bagicha of Uttar Jatrabari, Mirpur, Kachukhet and Hatirpool. 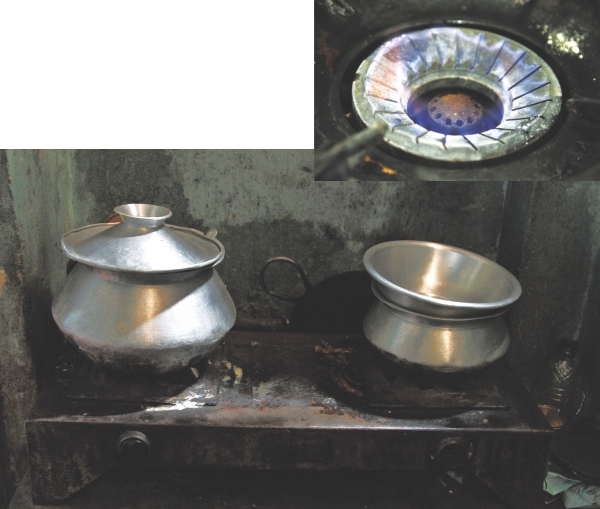 Dwellers in certain sections of Mirpur and Bashabo have been forced to switch to kerosene stoves due to the lack of gas supply. "In my area we don't get any gas supply in between 8 to 3 am. We complained to the Titas Gas a number of times, but the situation hasn't improved. It's difficult to feed the children before they go to school in the morning," says Maheen Choudhury, a resident of Kadamtala, Bashabo. Apart from suffering from frequent load shedding, Maheen also suspects that his electricity bill is being tampered with. "The electricity bill we get from the authorities is much higher than the metre reading," he says. Mohammed Ashraf Hossain, another dweller from Bashabo says that the gas lines set up by Titas Gas are not good enough for the increasing population in the area. Apart from the growing number of gas-users in the city, officials from Petrobangla have attributed the decrease in the pressure of gas to the increasing number of CNG gas stations in the city. Reports suggest that the country's present gas demand is falling short by 500 millions of standard cubic feet per day. They also state that as of 2011, the country has already consumed 50 percent of its probable gas reserves. Adding to the woes is the increasing prices of liquefied petroleum gas (LPG) cylinders which people opt for as a replacement to natural gas. The lack of gas-pressure and the fast expanding housing sector has created a huge demand for LPG in the market. This in turn has intensified the cost of gas cylinders. A review of the market indicates an increase of Tk 600 in the prices of gas cylinders in the last two months. Although the High Court, last year, had issued a ruling with regard to monitoring the prices of LPG cylinders, nothing much has been done ever since. Supporting the above statement are the series of projects that the government plans to take in the near future in order to generate electricity. Despite serious gas shortage, the government plans to build gas-based power plants worth 4211 megawatts, which, reports suggest, would require at least 800 million cubic feet worth of gas everyday for the next 15 years. The above mentioned plan of the PDB has also been criticised by officials from Petrobangla themselves. Recently the chairman of Petrobangla, Md Hossain Mansur, was quoted saying, “It is better not to expect to generate such a huge amount of electricity from gas. If anybody gives such a commitment, he has to do it on his own responsibility.” Disagreements between two important government agencies of the country, poses a huge question mark with regard to the future of the energy sector. The effects are already visible. 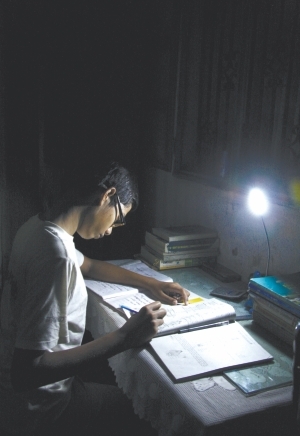 Apart from not being able to meet the general public's demand, an acute shortage of energy and power has already hampered the progress of several industries. The textile sector, a crucial aspect of the country's economy, for instance, is directly affected by the energy crunch, which in the long run, discourages new investment. The situation can only deteriorate further, in the upcoming months, as officials from the PDB, in a recent report, stated that the power shortage could be as high as 1000 megawatts a day during summer. As the condition of the city continues to worsen, one wonders if concerned officials have any plans at all to solve the multiple crises. At the moment, voices of residents, like Jahanara and Ayesha, are completely ignored. The high amount of discontent amongst dwellers of planned-residential areas also poses serious questions regarding the living conditions of the poorer sections of society. Changes in the strategy of the government to tackle these problems, is the need of the hour. The public's patience is wearing thin.